I have had some enquiries from people about issues that they have been having with SEFAUtil (ie. the Call Forwarding and Group Call Pickup tool from the Lync ResKit). Many of these questions have been about getting no response from SEFAUTIL after running a command. This can be for a few reasons, some of which may have to do with permissions, others to do with configuration. So in this post we’re going to go through the requirements and permissions needed for SEFAUtil as well as the permissions needed for running the Lync 2013 Call Pickup Group Manager. Before we go any further, some background; SEFAUTIL was designed to be run on a server that has Lync server components installed on it. As Jens Trier’s blog post on the tool points out, even if you want to run SEFAUTIL on a separate machine, it still needs to have Lync server base components installed. So it makes sense to choose to run the SEFAUtil on an Front End Server. How can we run SEFAUtil and the Call Pickup Manger on a server and only give a user accessing it minimum permissions? Well, as we all (may or may not) know, the Lync RBAC role permissions (ie. the Active Directory security groups starting with the prefix “Cs”, example “CsAdministrator”) do not apply to someone that is logged directly into a Lync server. 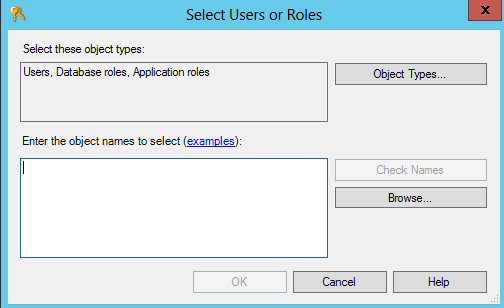 These roles only restrict access to users that are either connecting via Lync Control Panel, or via remote Powershell connection via the “OcsPowershell” webservice that runs on the Front End. 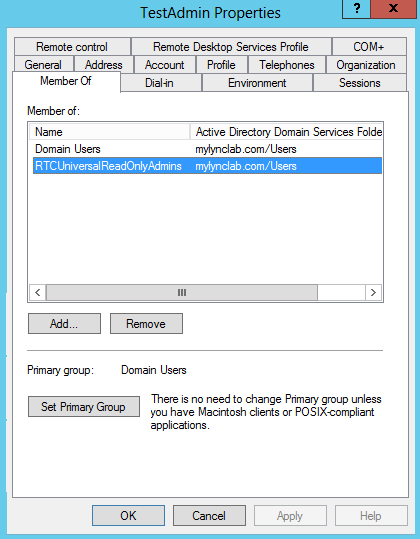 When you’re logged into the Lync server directly there are some Active Directory permissions that will affect your ability to access the backend SQL database which will stop you from running some commands. These SQL permissions are tied back to the Active Directory security groups that start with the “RTC” prefix. So, in short, these permissions can still affect a user's ability to access some commands/functions when logged directly into a Lync server. Note: These results are from lab testing. If you see any different results in the field, let me know. Error running SQL on 2013ENTFE004.domain.com : The SELECT permission was denied on the object 'Resource', database 'rtc', schema 'dbo'. This error is caused by the user not having sufficient rights to make direct SQL SELECT calls on the database. If you were logged in with Domain Admin rights you would not receive this error, as you would have sufficient permissions on the database (however, not everyone can be given Domain Admin permissions!). To get around this issue we will need to allow permissions for specific users to be able to make SELECT (read only) calls on the “rtc” database. 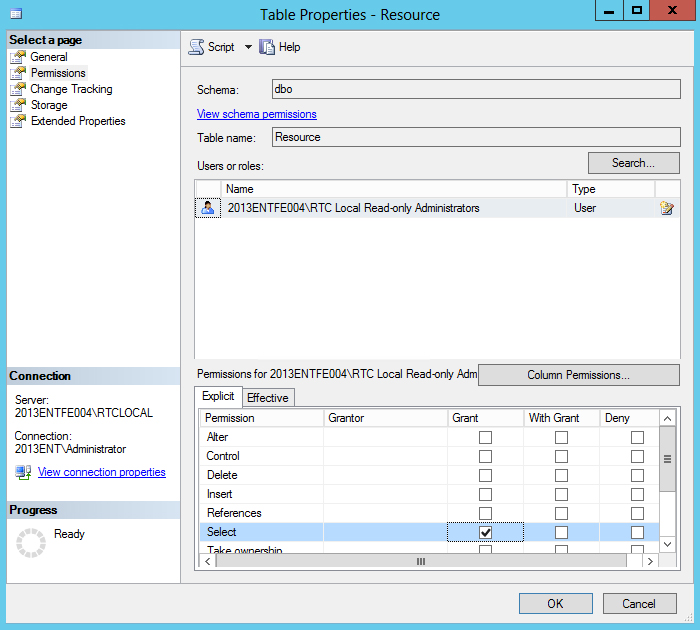 The simplest way to do this is to Grant “select” permissions to the “RTC Local Read Only Administrators” user within SQL for the “rtc” database. The “RTC Local Read Only Administrators” local machine user maps back to the “RTCUniversalReadOnlyAdmins” security group within Active Directory. So any user that you add to the “RTCUniversalReadOnlyAdmins” will have permission to run SQL SELECT commands on the database. This also works well, as SEFAUtil also requires a minimum of “RTCUniversalReadOnlyAdmins” group permissions to work, so it is a good choice for allowing permissions on the database as well. 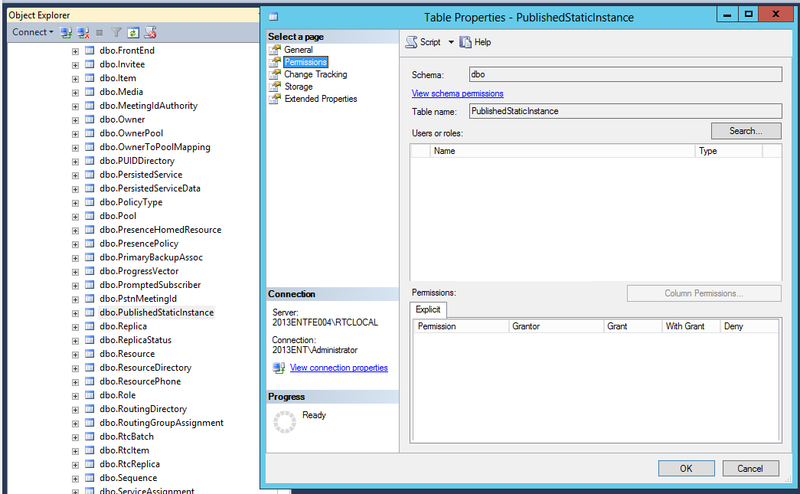 STEP1: Open SQL Management Studio (you will need to have installed this on a machine to access the database). 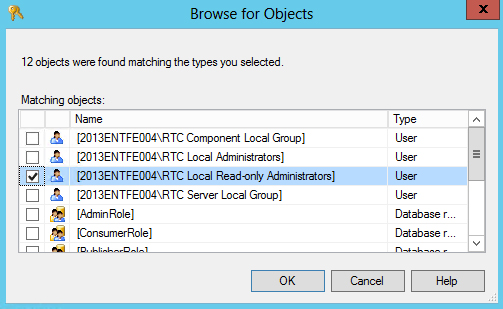 STEP 2: From the Object explorer, open the “Databases”->”rtc”->”Tables” tree. 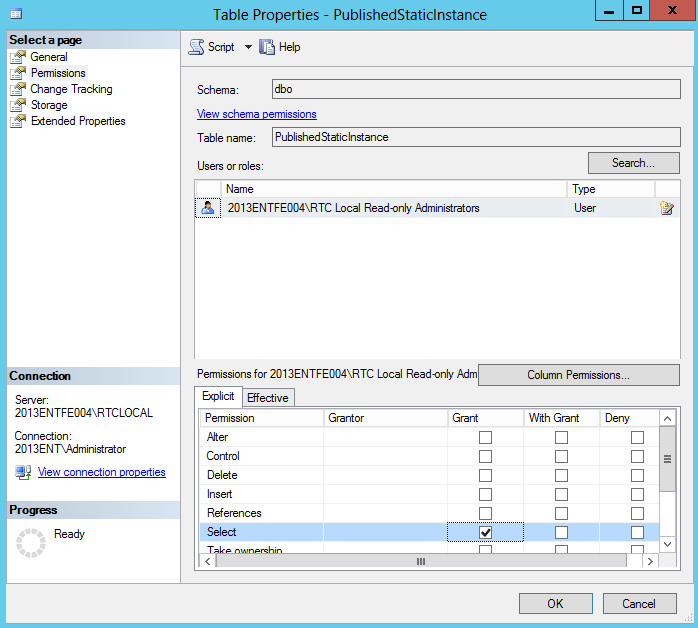 This script will give RTCUniversalReadOnlyAdmins SELECT permissions on all the Lync Front End Servers RTC PublishedStaticInstance and Resource database tables. 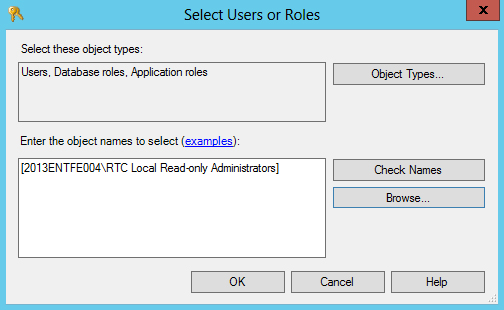 Run the script from a Lync server with a user account that has sufficient permissions to make changes to the "rtc" SQL database. This script is designed to give the minimum required permissions to the database for a user to use the Call Pickup Group Manager tool. Ensure that you have opened the Firewall ports for the RTCLOCAL database using the "OpenSQLPortsForCallPickupManager1.00.ps1" script before trying to running this permissions script. If you haven't opened the firewall you will get connection errors when you try and run this script. Microsoft.Rtc.Collaboration.ProvisioningFailureException:One or more values in the configured settings are invalid or unusable. Check inner exception and logs for more details. ---> Microsoft.Rtc.Internal.ServerConfiguration.SettingsInitializationException: The settings wrapper failed to initialize. Unable to find the Sqld database: Cannot open database "xds" requested by the login. The login failed. Login failed for user '2013ENT\testadmin'. The ExternalServer service is not installed on the machine. So anyway, that may have been slightly long winded, however, hopefully it was edu-taining for you all. In a nutshell you just need to put the user in the “RTCUniversalReadOnlyAdmins” security group, and add the SELECT permissions on the database. After that, you should be about to access SEFAUtil and the Lync Call Pickup Group Manager.